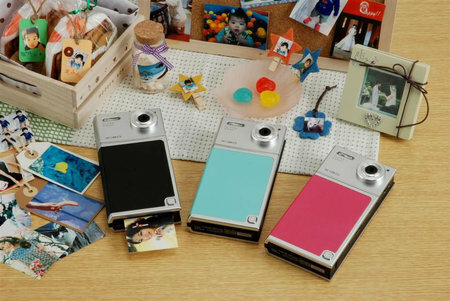 Tomy Xiao TIP-521is a first of its kind integrated digital camera and printer that allows users to capture, view, and immediately prints their digital images without ink, anywhere. The 5MP CMOS digital camera is available in three colors- black, magenta and green-marine, with 2.48-inch LCD display and 39mm equivalent fixed focal length lens. 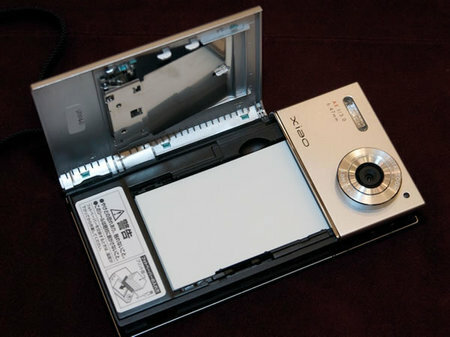 Tomy Xiao TIP-521 portable digital camera with 16MB memory prints out borderless images directly on special ZINK Paper (880 yen for set of 10) in less than 60 seconds. The patented ZINK Paper is an advanced composite material with embedded yellow, magenta and cyan dye crystals. The ZINK-enabled printer uses heat to activate and colorize these crystals. Tomy Xiao TIP-521 digital camera with built-in printer with SDHC/SD memory card slot will be available on Nov 28 for approximately 34,800 yen ($357).